InGen’s Jurassic Park project is located a hundred miles from the coast of Costa Rica and began construction shortly after 1979 when The Hammond Foundation leased Isla Nublar from the Costa Rican government for a biological preserve. 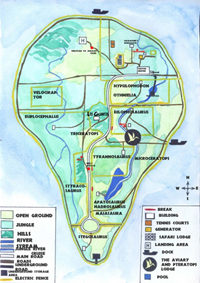 Whether Sorna came first and then Nublar is unknown, but InGen’s dreams came crashing to a halt in August of 1989, as the Isla Nublar Incident transpired and forced the company into Chapter 11 bankruptcy. 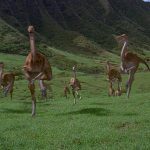 The status of the animal life on Isla Nublar is destroyed and is nothing more than an urban myth. 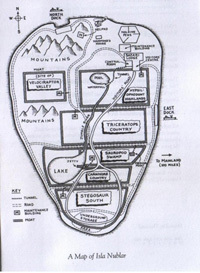 This map serves in a way as the “official” Isla Nublar Map for the novels, this map was published in the MacMillian English Language Teaching book that came out for the Jurassic Park novel, while grossly inaccurate as it does not account for everything and is slightly contradictory to what is stated in the novel, it does serve to create a general knowledge of where everything is located on Isla Nublar. As an answer to the inaccurate and slight contradictory nature of the map in the “MacMillian English Language Teaching” book for Jurassic Park. 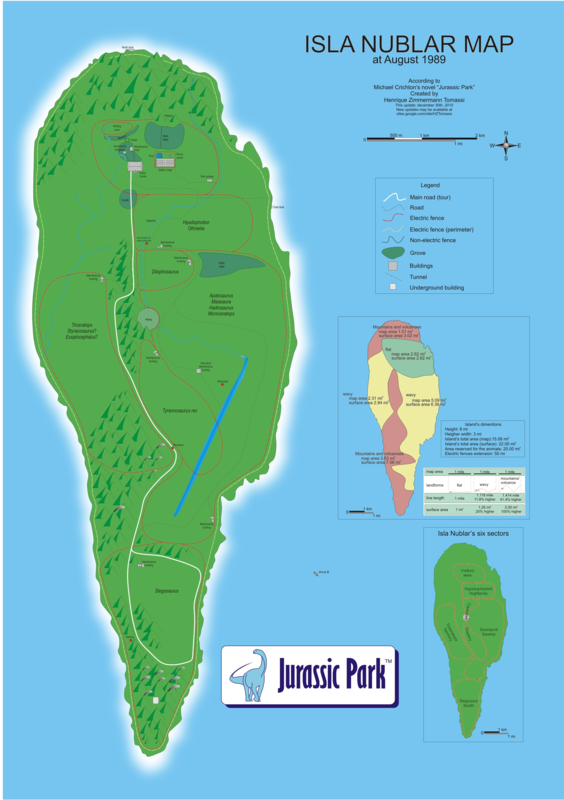 JPLegacy Members set out to create an accurate representation of the Isla Nublar map, using the MacMillian map as a basis and as well as the descriptions of the locations witnessed in the novel to finish it to create a comprehensive map for Isla Nublar in the novels. Probably the best Isla Nublar map out there now, this map was created by the talents of Henrique Zimmermann Tomassi. 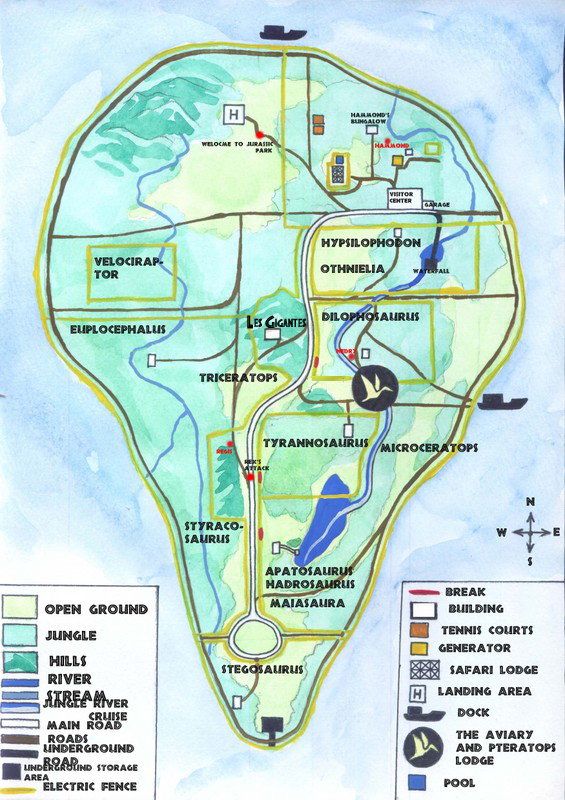 Tomassi based this map off of his interpretation of the locations seen in the Jurassic Park novel. At the moment this map is regarded by the community as the correct canon map. To read Tomassi’s blog you can visit it here regarding his viewpoint on the maps in the community and the explanation behind his map. His mission is, of course, the same as our own mission here on JPLegacy. We know that the island is 100 miles from the mainland, or maybe a little more. It has the shape of an inverted teardrop, bulging at the north, tapering at the south. It measures eight miles height and three miles at maximum width, in total some twenty-two square miles. 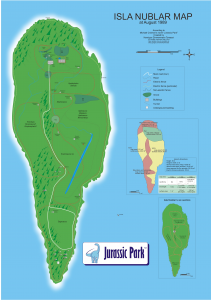 There is no detailed description of the island’s outline, so I just took the Arnold’s satellite picture outline (from the movie) and stretched it in order to fit in Nublar’s proportions. I’ve preferred to take this outline from something related to Jurassic Park instead to create something from my imagination. Most of the complexity of the map is inside the “Visitor Area”. We do know that there were only six divisions on the whole island. The “Visitor Area” was in the northern section and it contained structures such as the Heliport, the Visitor Center, the maintenance shed, the Hammond’s Bungalow, the Safari Lodge, the swimming pool, the tennis courts and the planting and shrubbery. There was also the East Garage, the holding pens, and the goat’s paddock. The helicopter entered the island from the north. The heliport was over a hill and from this point the characters could see a flat area, with the Visitor Area’s buildings. As we know that the north portion of the island has the highest hills of the island and they came from north to south in the helicopter, I deduced that the flat area should be south of the Heliport. The Heliport is a short distance, by foot, from the Safari Lodge. From the Heliport they walked thru a palm grove, an electric fence, along a swimming pool with smaller rocky pools and get to the Safari Lodge. The pool was in the lateral part of the building and the pool’s border was at ten or twelve feet from the building. The lodge had a special fence around it, only fifteen feet of the building. The Visitor Center is near the Safari Lodge and is possible to see it from the Safari Lodges’ main entrance. In one of the sides of the Visitor Center there is a palm grove. This grove must be located northern of the Visitor Center because there is a path among a grove leading north, to some other buildings. The Visitor Center is west of the Safari Lodge, because when Gennaro was north of the Visitor Center, he ran “to the forest” and, hiding there, he knew the maintenance shed was somewhere to the east. The Visitor Center main entrance is towards south, because its back door was facing north. From the Visitor Center, a path lead the characters to the north and they crossed a palm grove, saw the maintenance shed (mentioned as Power/Desalinization/Support in the chapter “Plans”), an animal enclosure with goats, a bamboo grove and found the holding pens. The maintenance shed is the northern building of all, its entrance is in the east side and from there Dr. Alan Grant could see the Raptors running from the Safari Lodge towards the Visitor Center. That means that the area between the maintenance shed and the Safari Lodge is an open ground, without forests and groves. We know that the Hammond’s Bungalow was in the island’s north portion, surrounded by palm trees. A path leads from the Visitor Center to the Bungalow, going north. When Hammond was attacked by the Procompsognathus, he was at a stream and “he could not be more than a hundred yards” from the Visitor Center and the Bungalow. So, the Bungalow is surrounded by palm trees, at north of the Visitor Center and the maximum distance between them is less than two hundred yards. Those information allowed me to locate the Bungalow inside that palm grove which is in the north side of the Visitor Center. From the east garage we only know that is located “more than a mile” from the Visitor Center and is… east. Well, I have put it in a maintenance road, at approximately 1,1 miles from the Visitor Center. The tennis courts are mentioned, but no one character actually see one in the novel. So its location is pure speculation. I believe that they should be near the pool, in the Safari Lodge. The pool and the tennis courts should be a recreation area in the island. In every tour enterprise the courts are expected to be near the resort’s hotel. There were only six divisions on the whole island, separated by electric fences and moats. The six divisions were: Visitor Area; Hypsilophodont Highlands; Triceratops Territory; Sauropod Swamp; Carnivore Country and Stegosaurus South. 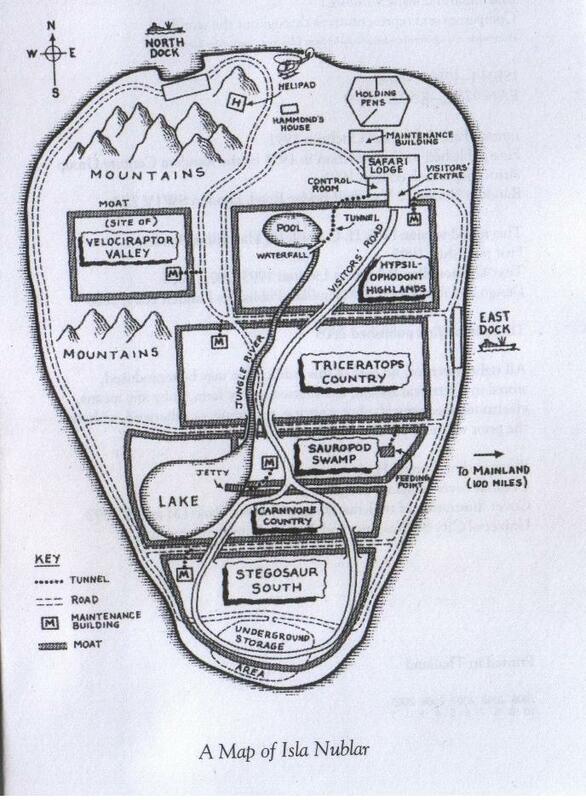 The “Velociraptor Valley” was to be built in the future. For the most part, the island was divided into big curving areas. The reserved area to the dinosaurs was twenty square miles. The main road ran north-south, one section of the road was literally cut into the side of a cliff, above a river. In the Park, the tour road was raised up above ground level, so the characters could see over the fences. The tour started at the Visitor Center. A line of Toyota Land Cruisers came out of an underground garage under the Visitor Center. The road crossed a palm tree grove, where they saw electric fences. At the east side of the road, there were the Hypsilophodon and Othnielia paddock. After this paddock, the cars kept forward, going south. The next paddock is the Dilophosaurus area. It is located east of the road and north of the Aviary. From the road section cut at the side of the cliff they could see a Dilophosaurus at the river that was flowing close to the hills. After the Dilophosaurus paddock, the road made a curve to the west and they saw the Triceratops paddock at the west side of the road. This paddock extends to the south, because at the point the T. rex attacks the car, there are high fences in both sides of the road. Still going south, they saw the Tyrannosaurus rex paddock at the east side of the road. From the point that the cars stopped, looking south they could see the sauropods in the lake. The T. rex paddock must had a northwest-southeast direction, because from the point that Dr. Grant entered the paddock, after the T. rex attack, he walked directly north, crossing the paddock in the middle. So, at least one part of the road must be south of the T. rex paddock fence. Continuing the tour, they saw the sauropods and hadrosaurs together, in the same paddock. This area is called “Sauropod Swamp”. Dr. Grant had entered this paddock after crossing the T. rex paddock from south to north, as the motion sensors sequence allow to prove. The only way to have this omnipresence is if the sauropod/hadrosaur area be located around the T. rex paddock, surrounding it in the south, east and north side. Another evidence that part of the sauropods paddock is north of the T. rex’s area is the sight that Dr. Grant had when he arrived the island. From the Heliport he could see the sauropod’s neck. The distance between the Heliport and the northern “Sauropod Swamp” can be only 1.6 miles. If the paddock was restricted to the area south of the T. rex paddock, the distance would be too large, about 4.1 miles, and Dr. Grant would not be able to see the dinosaurs. Is easy to understand that those herbivores need the biggest grazing fields in the park, that’s probably the reason for them to have such a huge paddock. I’ve putted also a palm tree grove in the sauropod’s northern end, because Dr. Grant saw them among those tress. The presence of Microceratops in the river, at north and south of the Aviary is evidence that the Sauropod Swamp also surrounds the metallic dome). The last paddock is in the island’s far south and has five square miles). The Stegosaurus lived in the island’s area with the most important volcanic activity. This is the only paddock in witch the main road came inside, because the characters get out of the car in order to see the sick Stegosaurus without jumping over any fencing. This point where they meet the sick dinosaur is near the ocean, because Ellie Sattler could hear it, and is in the southwest area of the paddock, because Dr. Harding says that the Stegosaurus use to graze mostly north and east of there. After left the sick Stegosaurus point, they went to a section of road that ran near the coastline, overlooking the beach and the ocean they turned back to north. This section must be at the east coast, because they saw the “Anne B” ship going to the mainland. Somehow they took the main road again and made the same trajectory back to the Visitor Center, but when they were in front of the T. rex paddock Dennis Nedry made his shutdown. The island had fifty miles of twelve-foot-high fencing. This includes the twenty-two miles around the perimeter of the island, for preventing the dinosaurs to escape. In the Park there were roads, tunnels and buildings. There was a different road system for animal handlers and feed trucks. From the Visitor Center, we know that there was a maintenance road towards east, the one that Nedry took in order to go to the East Dock. He was going to the East Dock, and get inside the Park by crossing an electric fence. From this point he believed the dock was not more than 1 mile and he would soon see the ocean in the left side of the road. So, the East Dock was relatively close to the Visitor Area, and there was a section of it heading south, near the beach. Another evidence that the East Dock is very near the Visitor Center is that Nedry thought that he could leave the Control Room and deliver the embryos in only three minutes, and after more three he would be back to the room. But Nedry missed the road to the dock and get to the Dilophosaurus paddock, in a dead end, close to the river. I tried to make a road that could easily make him get the wrong direction only by missing one entrance. It’s hard to believe that he would make a series of mistakes to get to the Dilophosaurus paddock. Another maintenance road starts at the south area of the island in the Sauropod Swamp, because at the beginning of it the characters saw the Apatosaurus. After a long time in this road, Dr. Harding and Ellie Sattler meet the Procompsognathus, at this point they were near the jungle river, it was off there somewhere to their left. Naturally, this road avoids the T. rex paddock, otherwise the animal handlers would be easily eaten… After meeting the Procompsognathus, they followed them for a wile in the road, and we know that those dinosaurs were after Nedry’s dead body, so I have made this section of the maintenance road heading to the Dilophosaurus paddock. After some time, Dr. Harding decides to get back to the Visitor Center and, as I made later, again the road avoid the Dilophosaurus paddock, because I believe no one would get in there if it was not really necessary. Then I just connected this road to that one that Nedry took, making possible to get to the Visitor Center without creating superfluous ways. At north of the T. rex paddock there is one maintenance road leading east, to the Sauropod Maintenance Building. There is no more information about this road, so I just connected it to the other maintenance road in the opposite side of the river. There was also a paved road running straight down from the Sauropod Maintenance Building toward the lagoon. I have made a small maintenance road from the tour road to the Dilophosaurus paddock, in order to create a way for Robert Muldoon to get to the field west of the river, where he “hunts” the T. rex. Some other small roads were created by me only to allow access to the maintenance buildings of each paddock. The road to north dock is speculative. There is no description of this road in the novel. I think it should follow the river, because there was a path already constructed for the river to flow, so its easy to built the road along this path. I also created a small road (not described in the novel) from the back to the Safari Lodge to the road that leads the north dock. I think it would be needed for supplies to be transported from the dock to the back of the lodge. There were two tunnels in the island. The first one “seemed to stretch away for miles” and connect the waterfall to the front of the Visitor Center. There is another tunnel at the island’s southern end, between the underground structure and the beach and below the electrified fence. In this second tunnel, thru some curves, Grant could get to the beach. At the north end of the island, the hills were highest, rising more than two thousand feet above the ocean. According to the topographic map that Dr. Grant saw in the trailer, there are hills at the center of the island and part of it were cut to fit the main road. The Aviary was also in area with hills, that’s why their paddock is called “Pterosaur Peak” and the visitors could not see it when they were in front of the Triceratops paddock. The southern end of the island had more volcanic activity than the north so is expected that there are a lot of hills in this area. If they are not higher than the northern hills we can assume that this volcanic activity is not very old and in some time the southern volcanoes will grow to the same size as the northern hills. The visitors smelled the sulfur fumes of the volcanic steam when they entered in the road section near the beach. There were flatlands in the island’s southern area. The Stegosaurus use to graze in the northern and eastern areas of its paddock. That is why I had made those two fields as the flatlands. Near the beach, the south end of the island is without volcanic activity, but with some hills, where the raptors had made their nest under a field of boulders. The volcanic steam is also present in the main road a few moments before the cars stop at the T. rex paddock. So it must be some volcanoes near this point. I have located those volcanoes inside the Triceratops paddock, because when the visitors were in front of the T. rex paddock they could not see the herbivores in the west side of the road. In the island there was a long thin lake that appeared to be man-made, with concrete dams and barriers. It was in the center of the island and had two miles long and a little more than one hundred yards wide. It could be seen in the Sauropod Swamp, south and north. Part of the lake is inside the T. rex paddock and the two carnivores drink its water. The younger the T. rex stays close to the water, near the southeast side of the lagoon. The older T. rex preferred the fields northwest of the lagoon. In a bend, the lake narrowed into the river they had seen in the Dilophosaurus paddock. The river is not natural, but a engineering work, because the water flow was turned off at some point in the story. Starting at the lake’s end, the river flows north right through the aviary through the Dilophosaurus paddock and on to within a half-mile of the Visitor Lodge. There was also a waterfall, falling north, after the Dilophosaurus paddock and then the river runs north. As the norther area has the highest mountains, the artificial river should flow into a ditch or cut in the mountains, so there insufficient gradient for water runoff. This cut is my interpretation, since at no time the book explains how the water flows in the northern portion of the island. I have created two patterns of river, one close to the hills (at the Dilophosaurus paddock, for example) and another at the open flat grounds (at the Othnielia paddock, for example). They are completely different grounds and this changes the flowing of the river. The river near the hills had a lot of curves (those curves are described when Dr. Grant crossed the Dilophosaurus paddock, chapter “The aviary”). The Park area was mostly open space, but there were some buildings in it. Each paddock had a few buildings, they were all concrete, with thick walls and usually located in out-of-the-way corners. Those are the only information given in the novel about the park’s maintenance buildings. So their disposition are highly speculative, with the exception of the Sauropod Maintenance Building. The Aviary is an aluminum dome constructed as a pattern of geodesic struts with a quarter of a mile in diameter or more. It is located south of the Dilophosaurus paddock, surrounded by the Sauropod/Hadrosaurs/Microceratops paddock. The East Dock of the island it’s a small utility dock and it’s location was already discussed at the “Maintenance road” item. The North Dock is where the big supply boats arrive. It’s location is speculative, because no further information about its location as well as the maintenance road to get there is given. There were also some underground constructions in the islands southern end, with an entrance from the beach. There are some elements that are cited in the novel, but they do not appear in the map. I did not added them because they did not existed when the novel took place. The “Velociraptor Valley” is only a static TV channel at the Safari Lodge. The absence of the Velociraptor paddock explains why those carnivores where at the holding pens in the Visitor Area. The only empty location in the island to construct a new paddock is north of the Triceratops paddock. That’s why I created a river in that area, because if there is a valley, there must be a river. And I believe it extended itself near the Visitor Center, where John Hammond was attacked and killed by the Procompsognathus. I think that same river could be used as a water source for the herbivores of the Triceratops Country. The same argument explains the absence of the Les Gigantes restaurant. It would be constructed somewhere between the Triceratops and the Dilophosaurus paddock. That is why I left an “empty” ground between the tour road and the Triceratops maintenance building. I think Les Gigantes could be constructed there. And what could we say about the missing dinosaurs? We know that there were dinosaurs from the Styracosaurus and Euoplocephalus genera. But they are mentioned only in the computer’s counting procedure and did not appeared somewhere else in the novel. So, considering that they’re herbivores, that the Styracosaurus is similar to the Triceratops and that the Euoplocephalus could live in peace with those two other genera, I have decided to locate them in the Triceratops paddock. We must also consider that the characters never walked inside this paddock and we did not know what were there, with the exception of the Triceratops appearance at the tour. The Styracosaurus and Euoplocephalus could live behind the hills, near the T. rex paddock. So, it is probable that the missing dinosaurs were there, but this opinion must be considered speculative, because no one saw those dinosaurs there. Prehistoric Dragonflies – In the first edition of the novel, Callovosaurus is noted as a Dinosaur on the tally screen; however, after the reclassification of Callovosaurus as Camptosaurus this was replaced in later versions by Microceratops, which was encountered in the trees above the river in the first edition of the first novel. In later editions of the first novel, Camarasaurus is added as one of Nublar’s inhabitants and it is classified under Apatosaurus. Leeches – Ed Regis noticed these after hiding from the Tyrannosaurus attack. Field mice – These were generally attributed by the control staff to be setting off the motion sensors.